I don’t post much (as you may have guessed from the state of this blog) but instead use Twitter (technically it’s known as micro-blogging, but choose your own moniker) where I go as SDCMoodle. I do a LOT of tweeting at events, and usually I get a lot out of it in return: Twitter works well as a collective thought process, taking in ideas and churning out divergent points of view and tengential ideas… You get out of it what you put in, I feel, a bit like the Moot itself. There were official bloggers, which I thought was a good idea, but I have to confess as I write this that I’ve read very little of what others have blogged. #mootieuk12 was my first Moot abroad and my fourth in total. My employer graciously agrees to send me annually (so far!) and although usually four of us go, this year it was only myself and @bbarrington who attended from South Devon College (and even then, only because we brought in extra income from our Making the Move to Moodle 2 conference earlier in the year: we upgraded to Moodle 2 in July 2011, after planning since January). Tough economic times, indeed. I personally see attending the Moots as ‘being amongst my people’ in a way, meaning the techies and the geeks really, but the educators and technologists too, and a lot more besides. Everyone in attendance has a passion for Moodle, that much is always obvious, but there are so many ways of being involved in Moodle (like buying up Moodle Partners, for example…). It’s good to get out of my niche occasionally, and also be able to chat about it incessantly, too. Unlike in 2011, this year I didn’t attend the Monday pre-conference workshops. I had considered it, as they had a moderately technical focus, but couldn’t easily justify the extra €100. I’m already fairly au-fait with the innards of Moodle, employed as I am as a web developer (with emphasis on Moodle) which is not to say I couldn’t know more, of course, but I’ve accomplished quite a lot already. I’m happy with my knowledge of blocks so far, and I’m working on my first proper module at the moment. So we decided I’d skip that day. Monday evening saw Moodlers randomly assigned tables and join forces to fight it out at the Quiz! (Some of us were were more competitive than others…) We came second to last, but at least we knocked out the team in last place by being marginally less bad than they were. For me, day one (Tuesday) saw the Course Manager module (not yet available on moodle.org/plugins) and pluggable visualisation, both of which looked brilliant (as Moodle is not known for its reporting abilities); ELIS for learner administration; a session entitled “The Best Moodle Tools You’ve Never Used” by Michelle Moore, Chief Evangelist at Remote Learner (best job title EVAR!) which thankfully we have and do, regularly (but the passion with which Michelle talked about these plugins probably made everyone in attendance who wasn’t already using them install them immediately); and lastly integrating DSpace with Moodle. DSpace is a FOSS repository web application, and I can think of a number of uses for it at work without trying. I can see us using it in the not too distant future, but not necessarily with Moodle! That evening was the Gala Dinner, which saw many new friendships being made, photographs being taken, videos being recorded and the mickey being taken. I am linking to none of it! I’m pretty sure some Guinness was drunk, too. Day two saw the Equella digital content management repository demonstrated, which I liked but don’t think we’d necessarily use; using Google Analytics to get fine-grained reporting of your Moodle courses (requiring minor developments on the Moodle side of things: watch this space); multi-tenancy in Moodle (maybe 2.4, but definately not 2.3) and Moodle Flavours: we run three instances of Moodle 2.x and one 1.9 (soon to be decomissioned), so multi-tenancy and Flavours could be quite useful to us (if we didn’t already manage the code and settings in other ways); and lastly “A Tale of Two Moodles” from City College London (IIRC) and a final session on LTI (Learning Tools Interoperability). The LTI session was a little quiet as @ghenrick enthused about how you can use it to seamlessly link Moodle to remote systems without requiring any [up-front] authentication, which I believe we the audience understood, but didn’t quite ‘get’: on stage was a person who had seen the light, trying to impart the knowledge to the masses of unsaved. There’s been a few blog posts from Mooters since then, so hopefully the goodness is spreading, but LTI: yay! At the end of the Moot a number of people had already left to catch ‘planes and such, so the closing panel was a little quiet, but despite a quiet ending I’d still judge the event a massive success. Gavin said they’d just about broken even, which is good as nobody wants to make a loss, but neither do they want the admission prices too high, as add travel and accommodation costs and you’re looking at quite a financial investment. After the Moot I spent a further few days wandering around Dublin and hopping on and off buses (yes, being a tourist!) and loving this city. Temple Bar was grand, inspiring me to pick up a CD from a band playing in the street (whose name currently escapes me as I haven’t unpacked yet) and eat food with cabbage in it. 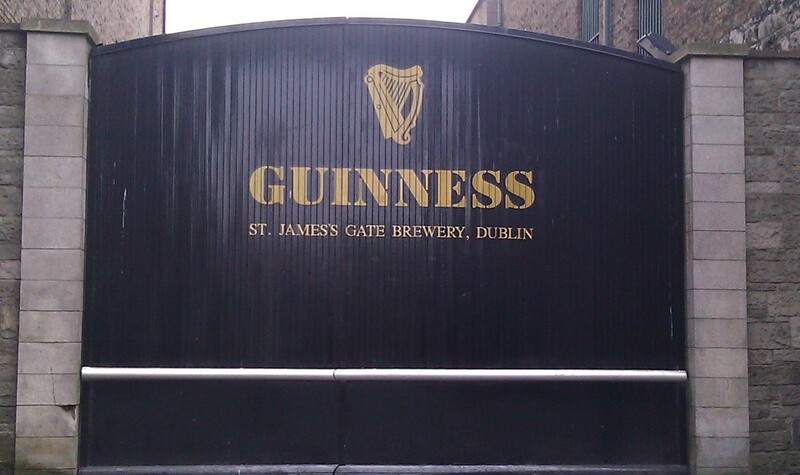 I saw the Guinness Storehouse, which while not the brewery itself, was worth the entry fee (as was the Gravity Bar at the top), and I got a lot of history and culture too. I particularly liked the “stiletto in the ghetto” and the “tart with the cart”, but I didn’t find the statue of Phil Lynott. Yet. Final thought: I hope the Dublin Tourist Board appreciates how much Guinness I drank while in Ireland!! Enjoyed reading your blog and had a few giggles, have added you to my list of blogs on my site. Thanks Shirley, can’t wait to start reading them.